Collecting money online for a worthy cause such as a memorial fund is easy to do with a DonationTo account. This crowdfunding platform gives users the ability to quickly launch a donation page, and it is not necessary to have any previous fundraising experience. In fact, most people can prepare their first page via DonationTo within five minutes. There are many perks associated with choosing our fundraising site to honor the memory of a deceased loved one, including gaining access to a robust list of free tools that will help you capture the attention of potential donors. For example, we offer a one-click email feature that makes it possible to message everyone in your address book at the same time. People who make online contributions to fundraisers prefer to have as many payment processing options as possible. After all, no one wants to set up a new account with a payment website for the sole purpose of making a donation. Therefore, DonationTo has partnered with PayPal and WePay so that people will be able to choose between these two popular payment processing companies. Jim Gray passed away in 2010 from cancer, and his family decided that they wanted to do something in his honor to help celebrate the vibrant life that he lived. According to Jim’s son, RJ, he was a man who loved giving to others, so it made perfect sense to put together a memorial campaign in his memory. RJ selected the Boys & Girls Club of Central Florida as the recipient of their fundraising efforts. 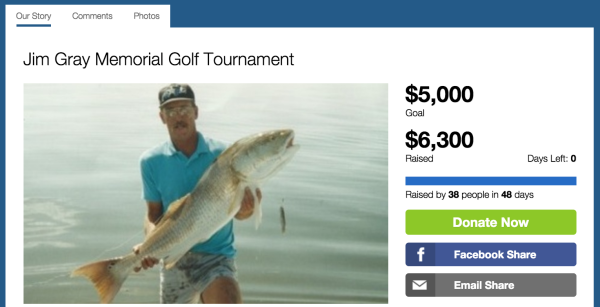 Instead of simply posting a DonationTo page, the family also organized a memorial golf tournament to be held on June 13, 2015, in Melbourne, Florida. This tournament is scheduled to become an annual event, and this will give Jim’s family and friends a wonderful opportunity to reflect upon his life while helping others in need. Although it is very wise to host local fundraising events, the reality is that you can reach a much wider audience by posting an online campaign. RJ understood this, so he combined his efforts to make sure that the Boys & Girls Club of Central Florida would receive the highest possible group donation. The online goal was set at $5,000. Within this total was the expectation that some people would pay for their golfing fees online, along with giving people from out-of-town a way to help out. As of June 12, this successful campaign had passed its goal by more than $1,000. One of the nice things about giving supporters the option to donate online is that they can easily use their credit or debit card. Each contributor is also given the opportunity to pay for DonationTo’s minimal processing fee, which means that the campaign will receive 100 percent of the money that has been donated. At DonationTo, we understand that people who are raising money online need the support of their family and friends. To help make this possible, we have enabled a comments feature on each fundraising page. Every person who makes a donation can leave some words of support, and they are posted to the page for everyone to read. Matt Goodyear utilized this feature when he wrote “excited to celebrate the life of one of the best men I have ever known.” This type of comment is very touching, and it is certain to provide the family with some solace while they mark the fifth year since Jim lost his battle with cancer. Losing a loved one is always hard, and the anniversary of their death can be an especially difficult time. Jim Gray’s family decided to turn this time period into an opportunity to celebrate life and help others. Launching the First Annual Jim Gray Golf Tournament will bring family and friends together, and it has also raised more than $6,100 for the Boys & Girls Club of Central Florida. Our fundraising platform provides numerous crowdfunding tools, ranging from a social networking integration to one-click emailing. Donors can make an online contribution via PayPal or WePay, and they will be given the ability to cover the processing fee so that 100 percent of their donation goes to a worthy cause.